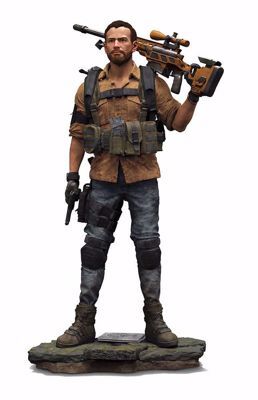 Ubicollectibles is proud to present its new figurine of Brian Johnson, former sniper with the Police Department in Baltimore, directly inspired from Tom Clancy’s The Division 2. Ubicollectibles is proud to present its new figure from Brian Johnson, a former Baltimore police sniper, inspired directly by Tom Clancy's The Division 2. This miniature shows the officer in his iconic posture and equipped with the TAC-50C sniper rifle, the weapon of choice for the Sniper Specialization, ready to defend a Washington city rendered unrecognizable by the chaos surrounding it. - Equipped with the weapon of choice of the Sniper Specialization: The TAC-50C sniper rifle. - This figurine can be assembled with the "Heather Ward" figurine of the Dark Zone Collector's Edition. UBIsoft is proud to present this beautiful Bust from the Legacy Collection series. This Altair Ibn-La'Ahad Bust is made of PVC with a height of 19 cm and a weight of 450 g.
UBIsoft is proud to present this beautiful Bust from the Legacy Collection series. This EZIO MENTOR Bust is made of PVC with a height of 19 cm and a weight of 450 g.
This awesome looking messenger bag looks like it has been used by Nathan Drake himself! It shows a partial map of the areas you explore in 'Uncharted 4: A Thief's End', with a matching red mark where the treasure is buried. 24cm figurine of AC Rogue main character: Shay.